Hey all you beauty lovers out there! Today I'm going to discuss a few actual hair care essentials. I say "actual" because, if you're like me, I'm sure you've been convincing yourself that every shine spray, pomade, cream, and mask that you've ever bought is the best thing since sliced bread. In fact, I'm sure you have a hoard of must-haves under your bathroom sink...but are they "essential" to your daily routine? Of course, in some cases, they may be your essentials, but read on for some tidbits about what I've found to be truly essential items when it comes to the basics of hair care. Your makeup looks best when you put on a primer, right? Why not think of a leave-in conditioner as your hair's primer! This may seem like an unnecessary step to some, but it detangles, helps you comb, and keeps your hair hydrated. Though leave-in conditioner sprays seem to be the most popular, I prefer the MOP Leave-In Conditioner Tube, which is a cream comprised of all natural, certified organic ingredients. The conditioner is also super concentrated, so a little goes a long way towards making your hair feel soft and healthy. Bonus: It doesn't weigh your hair down! Yes, hair oil is an essential, even if you have oily hair. I was a skeptic at first, since I am a very oily person, but after trying Enjoy Hair & Skin Treatment Oil and seeing the benefits, I'm a firm believer. At the very least, it cut my drying time in half! If you have dry hair, it's even more beneficial! Goodbye frizz, goodbye split ends; hello silky smooth locks! If heat is going to be a part of your daily routine (yes, a hair dryer counts! ), you MUST protect yourself accordingly with a heat protectant! You need a fantastic, lightweight spray that will not only protect you against the damage that is caused by heat styling, but that will also reconstruct and strengthen your hair. I recommend the Phyto Phytokeratine Repairing Thermal Protectant Spray. It smooths the cuticle with ceramides, protects the hair fibers, and repairs previous damage. People, it's 2016. We should all have a quality hairbrush and know what to do with it! Please stop brushing your hair incorrectly. You know what I'm talking about...from the roots to the ends? You are pulling your hair, causing knots and damage! I'm a fan of brushes that incorporate both nylon and boar bristles, like the ITech Magnetic Boar And Nylon Hairbrush. The boar bristles provide shine and body, while the nylon bristles grip without tangling. Repeat after me: I will not wash my hair every single day! As I mentioned previously, I'm an oily person. I feel the need to wash my hair daily, and end up making the situation worse. Dry shampoo helps me out, big time! My favorite is the Rock Your Hair Spray It Clean Dry Shampoo. It's definitely an essential because it absorbs your oils, boosts your hair's volume, keeps you feeling fresh, and eliminates the need to strip your hair through daily washes. Though everyone is different, I would recommend using dry shampoo about two or three times a week. I grew up with all of the women in my family having flawless, yet untouchable, big hair. To me, and really to anyone that may happen to touch your hair, it's important to find a hairspray that doesn't make your locks as hard as rocks. 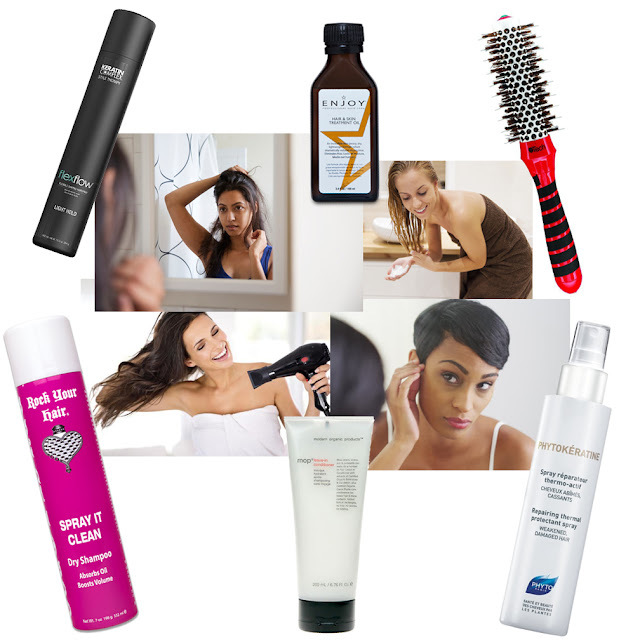 My personal favorite is the Keratin Complex Flex Flow Flexible Shaping Hairspray. It gives just the right amount of hold without jeopardizing the softness that you've worked so hard to obtain!